I’ve got a pure HTML app that compiles and builds successfully; however, when I load the IPA file into iTunes, on the first run iOS says that the app is 32-bit and will slow down the phone in future versions. Ideally I’d like to make the app 64-bit to avoid this but I cannot locate any assistance online or in any searches. Any assistance is appreciated! Which Cordova version are you using in your project? 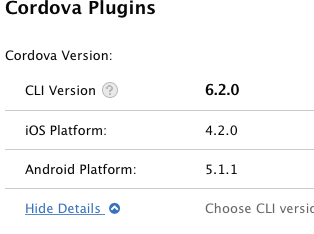 For Cordova 6.2 project, the release build app is 64-bit. If I am looking in the right spot in Monaca (Build, Project, Cordova Plugins) it appears I am using the 6.2 version? Yes, your project is using Cordova 6.2. Therefore, the release build of this project should be 64-bit. I think when you got the alert about the 32-bit and will slow down the phone in future versions, you used debug or adhoc build. Is that correct? If so, those two types of builds are 32-bit only. That’s why you get this warning. Thank you for your response. You are correct in that I did use the build with the “debug”. Thank you for clearing that up.